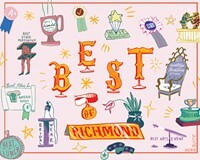 It opened in 1895, has received AAA's five-diamond rating for two consecutive decades and has been the place to stay for presidents, authors, athletes and actors visiting Richmond. But the Jefferson Hotel is not content to rest on its laurels. A major renovation this year will reduce the hotel's number of rooms from 262 to about 180, while increasing the size and luxury of every remaining room. Don't worry: The hotel, and its four-diamond restaurant, Lemaire, will remain open for business. The One Bed and Breakfast is named for the address of its Museum District house, which turns 100 this year. You can expect a cozy and historic atmosphere, hearty continental breakfasts and two friendly dogs. Located just down Franklin Street from the Jefferson, the Linden Row Inn is composed of seven connected and fully restored antebellum houses, including one where Edgar Allan Poe lived as a foster child.